Muslims and Westerners offer mixed views of each other. Majorities in Britain, France, Russia and the U.S. express favorable views of Muslims, but opinions are divided in Germany and negative in Spain. Similarly, Muslims in Lebanon, Jordan and Indonesia have positive opinions of Christians, while views are overwhelmingly unfavorable in Turkey and Pakistan; attitudes toward Jews are uniformly negative across the Muslim world. When asked whether they associate a series of four positive and six negative traits with people in Western countries, majorities or pluralities among nearly every Muslim public surveyed say Westerners are violent, greedy, fanatical, selfish, immoral and arrogant; far fewer associate positive traits such as generosity, honesty, tolerance and respect toward women with people in Western countries. 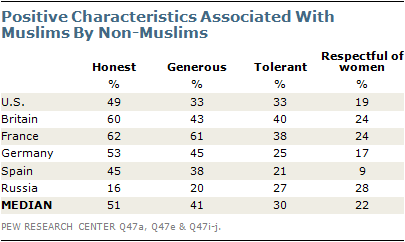 Non-Muslims in the U.S., Russia and Western Europe offer somewhat more positive views of Muslims than Muslims do of Westerners; for example, majorities or pluralities in five of the six countries say Muslims are honest, and non-Muslims in Britain, France and Germany also say Muslims are generous. Yet, many attribute negative characteristics, particularly violence and fanaticism, to Muslims, and few say Muslims are tolerant or respectful of women. 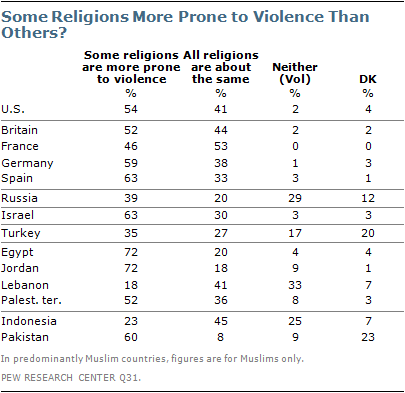 Moreover, to the extent that people in Western countries say some religions are more prone to violence than others, large majorities say Islam is the most violent religion. 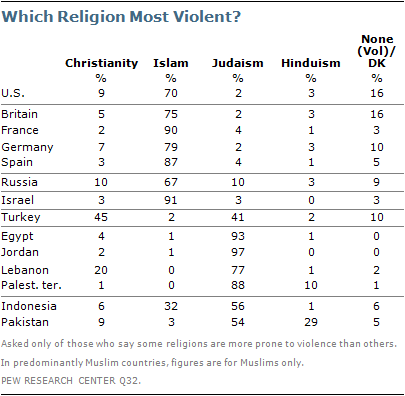 Among Muslims who say some religions are more violent, Judaism is typically named as the worst offender. Another notable difference between publics in many Western countries and in predominantly Muslim countries is in the way they see themselves. Christians in the four Western European countries surveyed and in Russia overwhelmingly identify first as citizens of their countries rather than as Christians; only in the U.S. do as many Christians identify primarily with their religion as identify with their nationality. In contrast, Muslims in most of the largely Muslim countries surveyed identify themselves primarily with their religion. Majorities in Britain (64%), France (64%), Russia (62%) and the U.S. (57%) express positive views of Muslims. Opinions are nearly divided in Germany, where 45% have a favorable view of Muslims and 47% offer negative ratings; in 2006, a majority (54%) of Germans had unfavorable views of Muslims, while 36% had positive opinions. In Spain, however, attitudes toward Muslims remain negative, although more now express positive views than did so five years ago. Somewhat fewer than four-in-ten (37%) Spanish respondents have a favorable opinion, while a 55%-majority expresses unfavorable views of Muslims; in 2006, about three-in-ten (29%) had positive views and 61% had negative opinions. Opinions about Muslims are especially negative in Israel. About one-in-five (19%) Israelis have favorable opinions, while 79% say they have an unfavorable view; among Israeli Jews, just 9% have positive views, while nine-in-ten have negative views of Muslims. In contrast, 87% of Muslims in Israel have a positive opinion of those who share their religion. Majorities among the other Muslim publics surveyed also express positive views of Muslims, although fewer Muslims in Turkey do so than was the case five years ago (72% now vs. 88% in 2006). In France, Germany, Spain and the U.S., views of Muslims are more positive among younger respondents. For example, while most (57%) Germans younger than age 30 have favorable opinions of Muslims, 45% of those ages 30 to 49 and just 39% of those 50 and older share this view. In the U.S., majorities among those younger than 30 (69%) and those ages 30 to 49 (62%) express positive opinions of Muslims, compared with about half (48%) of older respondents. In Spain, fewer than half across age groups offer positive views, while in France, majorities in the three groups do so. But in both countries, younger respondents are more likely than older respondents to express favorable opinions. Opinions about Christians remain overwhelmingly positive in the U.S., Western Europe and Russia; at least three-quarters in Spain (76%) and Germany (75%) and more than eight-in-ten in the U.S. (89%), Russia (89%), France (84%) and Britain (83%) express favorable views. Outside of these predominantly Christian countries, views of Christian are more mixed. For example, a narrow majority (54%) of Israelis offer positive opinions of Christians, reflecting a divided opinion among Israeli Jews; 51% have a favorable view and 48% have an unfavorable opinion of Christians. Two-thirds of Muslims in Israel have a positive view of Christians. Among the Muslim publics surveyed, those in Lebanon offer the most positive ratings of Christians; 96% express a favorable opinion of the religious group, which makes up about 40% of the Lebanese population. Majorities of Muslims in Jordan (57%) and Indonesia (52%) also rate Christians favorably; Egyptian Muslims are nearly evenly divided, with 48% offering positive views and 47% saying they have an unfavorable opinion. In contrast, Muslims in Turkey and Pakistan offer overwhelmingly negative views of Christians. In Turkey, just 6% of Muslims have a favorable view and 82% offer negative opinions of Christians; among Pakistani Muslims, 16% have positive opinions and 66% offer unfavorable views. Favorable ratings of Christians among Muslims in Turkey and Pakistan are even lower than they were in 2006, when 16% and 26%, respectively, expressed positive views. Attitudes toward Jews are positive in the U.S., Russia and Western Europe; at least seven-in-ten in France (84%), the U.S. (82%), Britain (76%) and Germany (71%) have favorable opinions of Jews, as do 63% of Russians and 59% in Spain. Views of Jews among Spanish respondents are considerably more positive than they have been in recent years. In 2006, 45% had a favorable opinion and 39% had a negative view of Jews; as recently as 2008, more in Spain had an unfavorable opinion (46%) than had a favorable (37%) view of Jews. Ratings of Jews are dismal in the seven predominantly Muslim nations surveyed. About one-in-ten (9%) Muslims in Indonesia, and even fewer in Turkey (4%), the Palestinian territories (4%), Lebanon (3%), Jordan (2%), Egypt (2%) and Pakistan (2%) express favorable opinions of Jews. Israeli Muslims, however, are divided in their opinions of Jews; 48% have favorable views and 49% express negative opinions. Majorities in Israel (63%), Spain (63%), Germany (59%), the U.S. (54%) and Britain (52%), and a 39%-plurality in Russia, believe that some religions are more prone to violence than others. And when those who share this view are asked which religion they think is the most violent, large majorities in each of these countries name Islam. The view that Islam is the most violent religion is particularly prevalent in Israel, France and Spain, where about nine-in-ten (91%, 90% and 87%, respectively) of those who say some religions are more prone to violence consider Islam to be the most violent. At least two-thirds of those who say some religions are more violent than others in Germany (79%), Britain (75%), the U.S. (70%) and Russia (67%) also select Islam as the most violent. Among the Muslim publics surveyed, majorities in Egypt (72%), Jordan (72%), Pakistan (60%) and the Palestinian territories (52%), as well as a 35%-plurality in Turkey, think some religions are more prone to violence than others. In Indonesia and Lebanon, more Muslims say that all religions are the same when it comes to violence (45% and 41%, respectively) than say some are more violent than others (23% and 18%). Majorities of Muslims in Turkey, Egypt, Jordan and the Palestinian territories associate each of six negative traits – violence, greed, fanaticism, selfishness, immorality and arrogance – with people in Western countries such as the United States and Europe. Many in Pakistan, Lebanon and Indonesia also attribute these negative characteristics to Westerners. Views of Westerners are particularly negative in Jordan; at least seven-in-ten Muslims in that country say Westerners are violent (78%), greedy (74%), selfish (73%), or immoral (73%), while 66% describe Westerners as fanatical and a narrower 53%-majority say they are arrogant. In contrast, Lebanese Muslims offer the least negative views of Westerners among the Muslim publics surveyed. For example, about a third of Lebanese Muslims describe people in Western countries as violent (34%) and arrogant (35%), while about half do not associate these traits with Westerners (51% and 49%, respectively). A substantial minority of Muslims in Lebanon say Westerners are greedy (41%), fanatical (41%) and immoral (38%), but more say that is not the case. And while Lebanese Muslims are about evenly divided when asked if Westerners are selfish – 43% say yes and 41% say no – majorities of Muslims in the other countries surveyed attribute this trait to people in Western countries. When asked whether they associate each of four positive traits with Westerners, majorities or pluralities of Muslims in nearly every predominantly Muslim nation surveyed say they do not think of Westerners as generous, honest or tolerant. However, many Muslims say people in Western countries are respectful of women, including majorities in the Palestinian territories (56%) and Lebanon (55%) and a 46%-plurality in Indonesia; among Egyptian and Jordanian Muslims, the perception that Westerners are respectful of women is more common than it was in 2006, although more in these countries still say this trait does not describe Westerners than say it does. Muslims in Turkey and Pakistan are the least likely to associate positive traits with Westerners. Fewer than one-in-five Pakistani Muslims say people in Western countries are generous (17%), honest (16%), respectful of women (16%) or tolerant (12%). In Turkey, three-in-ten Muslims say Westerners are respectful of women, while just 19% describe Westerners as honest or tolerant and 15% say people in Western countries are generous. Compared with five years ago, Indonesian Muslims consistently offer more positive assessments of Westerners. More now attribute positive characteristics such as honesty (33%, up 13 percentage points), generosity (38%, up 8 points), respect for women (46%, up 8 points) and tolerance (41%, up 7 points) to people in Western countries than did so in 2006; the percentages of Indonesian Muslims who say Westerners are violent, greedy, selfish, immoral or arrogant have declined by double digits. In contrast, Pakistani Muslims express far more negative views of Westerners than they did in 2006. For example, 64% of Muslims in Pakistan now say people in Western countries are greedy, compared with 44% who shared this view five years ago; the percentage saying Westerners are immoral, selfish or fanatical has also increased by double digits (16, 14 and 13 percentage points, respectively). More Pakistani Muslims also say Westerners are violent (58% vs. 49% in 2006) and arrogant (61% vs. 53%). Fewer Pakistani Muslims now say people in Western countries are generous (down 7 percentage points), respectful of women (down 6 points) or honest (down 5 points). Opinions of the negative traits associated with Muslims are mixed across the U.S., Russia and the four Western European countries surveyed. Majorities or pluralities of non-Muslims in these countries do not associate greed and immorality with Muslims; but most non-Muslims in Spain (80%), Germany (68%), Russia (64%) and France (52%) say Muslims are fanatical, and majorities in three of these countries also describe Muslims as violent (61% in Spain and 54% in Germany and Russia). The U.S. and Britain are the only two countries where fewer than half of non-Muslims attribute each of the six negative traits tested to Muslims, but even in these countries many have negative views. For example, about the same number of non-Muslims in the U.S. says Muslims are violent (45%) as say they are not (46%). Non-Muslims in Britain are nearly evenly divided on whether or not Muslims are fanatical: 43% say yes and 42% say no. Non-Muslims in the U.S., Russia and Western Europe also offer mixed views of the positive traits tested. Majorities or pluralities in France (62%), Britain (60%), Germany (53%), the U.S. (49%) and Spain (45%) say Muslims are honest; a majority in France (61%) and a plurality in Germany (45%) and Britain (43%) also say Muslims are generous. 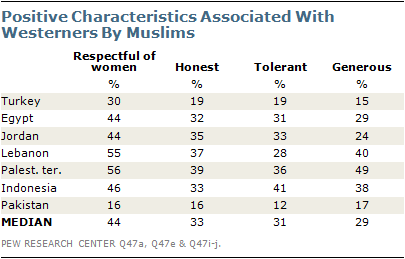 Yet, nowhere does a majority or plurality of non-Muslims describe Muslims as tolerant or respectful of women. Russians are the most likely to say Muslims respect women, although just 28% of non-Muslims in that country say this is the case. In Spain, only 9% say Muslims are respectful of women. Four-in-ten non-Muslims in Britain say Muslims are tolerant, more than in any other country. Changes in views of traits associated with Muslims have not been consistent across the U.S., Russia and Western Europe since 2006. For example, non-Muslims in Russia are generally less likely to attribute positive characteristics to Muslims, but they are also less likely to say that Muslims are violent, selfish or fanatical. Similarly, more in Spain now say Muslims are generous than did so five years ago, but more also see Muslims as selfish, arrogant and immoral. In general, younger respondents and those with college degrees tend to offer more positive views of Muslims, while older and less-educated respondents are more likely to associate negative traits with this religious group. For example, in France, Germany and Spain, non-Muslims with a college degree are more likely than those with less education to say Muslims are generous and honest; by comparison, those without a college degree in these countries are more likely than the more educated groups to say Muslims are violent, greedy, fanatical, immoral and selfish. On balance, Muslims in the predominantly Muslim countries surveyed are more likely to associate negative characteristics with Westerners than non-Muslims are to associate them with Muslims. For example, nearly nine-in-ten (89%) Jordanian Muslims use at least three of the six negative adjectives tested to describe people in Western countries, as do majorities in Egypt (81%), Turkey (73%), the Palestinian territories (71%), Pakistan (67%) and Indonesia (63%); only in Lebanon is this not the case. In contrast, Spain is the only Western country surveyed where a majority (60%) of non-Muslims associate three or more negative characteristics with Muslims. At least three-in-ten non-Muslims in Britain (39%), the U.S. (35%) and France (30%) do not attribute any of the six negative characteristics tested to Muslims. Most Christians in the Western European countries surveyed and in Russia think of themselves first in terms of their nationality rather than as Christians. This is especially the case in France, where nine-in-ten Christians see themselves as primarily French. Seven-in-ten Christians in Germany, 68% in Russia, 63% in Britain and 53% in Spain also identify primarily with their nationality rather than their religion. National identification is even more widespread among Christians in Britain, France, Germany and Russia than it was five years ago, when majorities already identified primarily with their nationality. The change is especially notable in Germany, where the percentage seeing themselves first as Germans is up 11 percentage points, from 59% in 2006. In contrast, American Christians are evenly divided; 46% see themselves primarily as Christians and the same number consider themselves Americans first. In 2006, national identification was slightly more common than religious identification among Christians in the U.S. (47% vs. 43%). Religious identification among Christians in the U.S. is especially prevalent among white evangelicals. Seven-in-ten in this group see themselves first as Christians rather than as Americans, while 22% say they are primarily American. Among all other American Christians, more identify primarily with their nationality (55%) than identify with their religion (38%). With the exception of Lebanon and the Palestinian territories, majorities and pluralities in the predominantly Muslim countries surveyed see themselves first as Muslims rather than as citizens of their country. This is especially the case in Pakistan, where 94% of Muslims identify themselves primarily with their religion; in Jordan, about two-thirds (65%) see themselves first as Muslims. Pluralities of Muslims in Turkey (49%), Egypt (46%) and Indonesia (40%) also consider themselves Muslims first, while 21%, 31% and 35%, respectively, self-identify primarily with their nationality. However, significantly fewer in Egypt now primarily identify with their religion than did so in 2005, when about six-in-ten (59%) Muslims identified themselves primarily with their religion, while 23% saw themselves first as Egyptians. In Lebanon, however, 36% see themselves primarily as Lebanese, while 28% see themselves first as Muslims. Palestinians are more divided; 43% self-identify first as Palestinians and 40% consider themselves primarily Muslims. Majorities of Israeli Jews and Muslims identify first with their religion rather than as Israelis, but this is especially the case among Muslims. About three-quarters (77%) of Muslims in Israel think of themselves primarily as Muslims, while just 10% say they are Israeli first. Among Jews, 57% prioritize their religious identity and 22% self-identify as Israelis.